Graduations always make me feel a bit ridiculous because they involve mortar boards, full-length robes, velvet stoles, satin cords, and basically every other piece of old-timey regalia. Every time I attend or participate in a commencement, I giggle at all this pomp and circumstance. 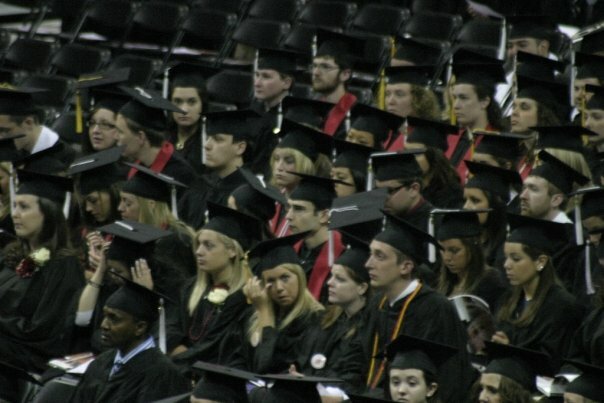 Everyone looks so serious and studious, as though the robes conceal argyle vests and pressed slacks rather than Sharpie tattoos from the night before. That being said, I’m glad that graduations still entail a high level of decorum. Without graduations (and weddings, for that matter) we may never find an occasion to swap our kicks and jeggings for heels and gowns. It’s nice to channel the past — a time when people dressed up to visit the airport, go to church, and attend Millard Fillmore’s stump speeches. This week, four writers will reflect on graduations. Some will look back, some will look forward, but all will touch on the significance of the occasion. Slipping Millard Fillmore into your article made it a smash hit for me. Thanks.